WAME is in touch with the people. We believe that to understand how best to help it is necessary to listen; to find out what they need; what their hopes and goals are; how they see the future. Only in this way can the mistakes of well-meaning but misguided "developers" can be avoided. We listen, consult and listen some more. WAME wants every contribution to be used wisely to help where it can best serve. fWe CARE about the people we serve. We have sponsored scores of children for their school fees, uniforms, books and school supplies. WAME goes to work. 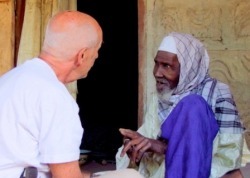 We work to improve facilities at rural clinics in The Gambia and Senegal. 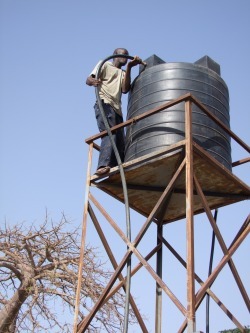 We completed installation of a new water system in the clinic at Illiassa Village on the North Bank of the River Gambia. In the Outpatient Block there are now sinks in each room where nurses can wash their hands between patients. In the Maternity Block there is now a working bathroom with sink, toilet and shower. In the delivery room newborns can now be bathed in fresh, running water. There are working toilet facilities for patients and visitors. The kitchens and bathrooms in the staff quarters are now operative. We constructed an outpatient facility at Noo Kunda Village. This multi-purpose building is used for teaching, well-child examinations, immunization clinics, and as a waiting area out of the sun and rain. We installed window screening at the clinic in Jappineh Village. The patients will be able to sleep in a mosquito-free environment; a low-tech means of preventing malaria. The new roof on the clinic at Saba keeps the rain -- and roosting bats! -- out. A new maternal/child health center in Alikali Kunda is being used for well-child clinics, immunizations and teaching -- built by WAME! And solar lighting just brought to Noo Kunda is helping deliver babies.